The ability to display diagnostic trouble codes (DTC) is an optional feature. Codes may be displayed on either the gauge cluster or an optional vehicle information display (VID). The vehicle must be equipped with the option to display codes in both cases. Codes will not be displayed on the gauge cluster if the vehicle is equipped with the VID. Turn the key switch to the ACCESSORY position to view only previously active codes. Turn the key switch to the IGNITION position to view both active and previously active codes. Momentarily press the Cruise “ON” switch and the Cruise “Resume” switch at the same time. NOTE – The gauge cluster will only display “Software Rev” and “Hardware Rev” for 5 seconds followed by the message “Diagnostic Trouble Codes are not available” if the vehicle is not equipped with the option to display codes. NOTE – Turning the key switch off, turning the key switch to the CRANK position, or releasing the park brake will take the gauge cluster out of the diagnostic mode. The VID can be used to display all diagnostic trouble codes (DTC) on the vehicle. Suspect parameter number (SPN), failure mode indicator (FMI) and occurrence count numbers are listed. Source addresses and DTC descriptions are presented in plain text. NOTE – The VID will display “Not Available” if a DTC description is not available for a particular fault. • The key switch is in the IGNITION position. • AND the programmable parameter “Diagnostics” is enabled using Diamond Logic® Builder (DLB). • The vehicle is not moving (the Vehicle Speed is equal to zero). • The feature is not password protected to prevent unauthorized access. 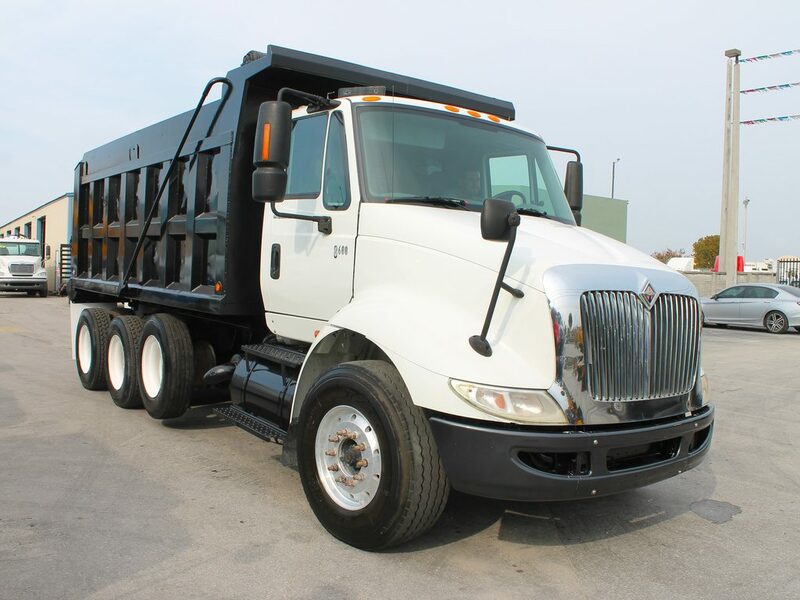 Refer to the Vehicle Information Display Owner’s Manual for more information. NOTE – The following selections will not be available if the vehicle is not equipped with the option to display codes. 3. Select “ACTIVE” or “INACTIVE”. The VID may initiate a password prompt if the VID has been password protected. Refer to the Vehicle Information Display Owner’s Manual for more information. The VID will indicate “NO FAULT DETECTED” if faults are not found. Scroll through the list of faults if faults are present. Previously active diagnostic trouble codes can only be cleared by a service tool, such as Diamond Logic® Builder (DLB). Some previously active codes may not be cleared by this method. “SPN” represents the Suspect Parameter Number. This number identif es the item for which diagnostics are being reported. FMI” is the Failure Mode Indicator. This number represents the type of failure detected. Refer to Failure Mode Indicators (FMI) below for more information. Active” or “Previously Active” will be displayed to identify whether a fault is currently active or if the fault was previously active. OC” is the Occurrence Count. This number represents the number of times a fault has gone from previously active to active. “SA” is the Source Address. This number identif es the module reporting the fault. Refer to Source Addresses (SA) for more information. NOTE – The available source addresses will vary depending on each vehicle configuration. NOTE – Diagnostic Trouble Codes listed in this document are Body Controller, Auxiliary Gauge Switch Pack, Secondary Instrument Cluster, Instrument Cluster, Rear HVAC Module, and Compass Module. 3 Comm. fault from ESC/BC to PP3. DC Module Overvoltage condition on Datalink interrupted between ESC and Powerpack. An Over Voltage Condition in the DC The Power Pack E Module has stopped receiving heart beet message from the ESC/BC. 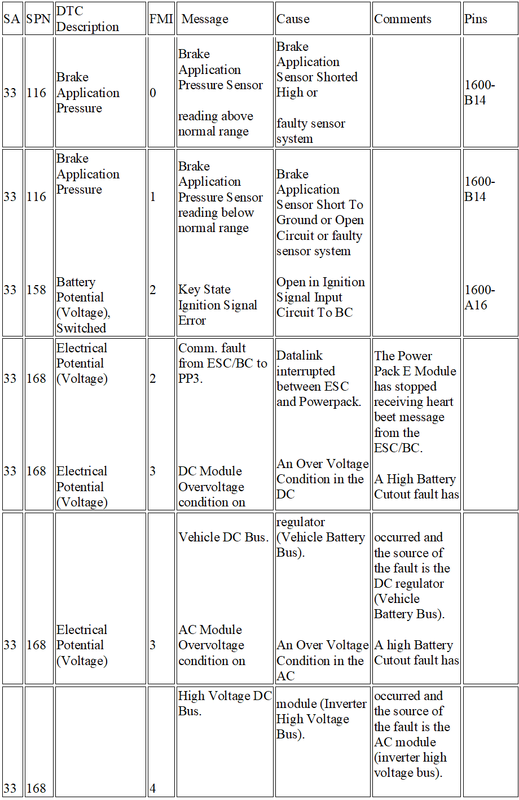 AC Module Overvoltage condition on regulator (Vehicle Battery Bus). An Over Voltage Condition in the AC occurred and the source of the fault is the DC regulator (Vehicle Battery Bus). 4 High Voltage DC Bus. DC Module Undervoltage condition module (Inverter High Voltage Bus). An Under Voltage Condition in the DC occurred and the source of the fault is the AC module (inverter high voltage bus). 4 on Vehicle DC Bus. AC Module Undervoltage condition regulator (Vehicle Battery Bus). An Under Voltage Condition in the AC occurred and the source of the fault is the DC regulator (Vehicle Battery Bus). 6 on High Voltage DC Bus. AC Module has shutdown due to module (Inverter High Voltage Bus). A Surge may have occurred for a while in occurred and the source of the fault is the AC module (inverter high voltage bus). Phase missing fault/alternator fault. the Vehicle AC bus for a long time (The inverter supplies additional current to the load). One or more of the three phase wire from detected in the AC module and the Vehicle AC bus is shutdown. DC module over temperature the Dynamic Alternator to the Power Pack E module may be disconnected. An overcurrent condition in the Vehicle DC wires from the alternator is disconnected. The Power Pack system is shutdown and requires an ignition cycle. AC module over temperature Bus might have caused an over temperature. An overcurrent condition in the Vehicle AC occurred and the source of the fault is the DC regulator (Vehicle Battery Bus). PPE3 Fuse Open. Bus might have caused an over temperature. Load exceeded rating. occurred and the source of the fault is the AC module (inverter high voltage bus). PPE3 module Fuse is Open. Work Light Switch Error bandwidth). message from PowerPack E module. Timeout proprietary, private bus (body builder) (address 255) has an unknown fault. 0 The filter between the fuel pump and the fuel tank is plugged. indicates a severely restricted or plugged condition. compressor is shut off to prevent damage. 33 2609 Cab A/C Refrigerant Compressor 16 HVAC High Pressure Protection HVAC Head Pressure exceeded 480 psi. Over current for Parked Regen Indicator Circuit. Parked Regen Switch Error Parked Regen Switch Indicator. 6 (Constant Supply) output is Under Current Or Open Circuit. 5 (Constant Supply) output is overcurrent. 6 (High) Output is Under Current Or Open Circuit. 5 (High) output is overcurrent. 6 (Neutral) output is Under Current Or Open Circuit. 2 (Neutral) output is overcurrent. 5 Switch state is invalid. Crossing Gate output is overcurrent. RPM 1 Channel 1 Switch Error bandwidth). stopped receiving heart beat message from the BC. 4 AC Module Overvoltage condition on High Voltage DC Bus. AC Module Undervoltage condition An Over Voltage Condition in the AC module (Inverter High Voltage Bus). An Under Voltage Condition in the AC A high Battery Cutout fault has occurred and the source of the fault is the AC module (inverter high voltage bus). 5 on High Voltage DC Bus. Air Horn Undercurrent module (Inverter High Voltage Bus). Open in Air Horn Circuit occurred and the source of the fault is the AC module (inverter high voltage bus). inverter supplies additional current to the Vehicle AC bus is shutdown. 33 520772 PPE3 Fuse Open 31 PPE3 Fuse Open. Load exceeded rating. PPE3 module Fuse is Open.